Periventricular leukomalacia (PVL) is the most common ischemic brain injury in premature infants. The ischemia occurs in the border zone at the end of arterial vascular distributions. The ischemia of periventricular leukomalacia occurs in the white matter adjacent to the lateral ventricles. 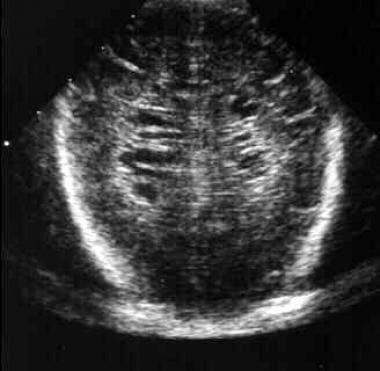 The traditional diagnostic hallmarks of periventricular leukomalacia are periventricular echodensities or cysts detected by cranial ultrasonography, as shown below. More recently MRI studies have demonstrated a relatively common diffuse non-cystic form of periventricular leukomalacia in premature infants. Diagnosing periventricular leukomalacia is important because a significant percentage of surviving premature infants develop cerebral palsy (CP), intellectual impairment, or visual disturbances. Cranial ultrasound, coronal view, in a 3-week-old premature infant. Multiple bilateral periventricular cysts are typical of this stage of periventricular leukomalacia (PVL). Courtesy of Matthew Omojola, MD. The pathophysiology of periventricular leukomalacia is a complex process. Periventricular leukomalacia occurs because of ischemia induced injury to oligodendrocytes in the periventricular area of the developing brain. Cytokine-induced damage following maternal or fetal infection may play a role. Periventricular leukomalacia is a white matter lesion in premature infants that results from hypotension, ischemia, and coagulation necrosis at the border or watershed zones of deep penetrating arteries of the middle cerebral artery. Several factors related to vascular development make the periventricular region of the preterm brain uniquely sensitive to ischemic injury. First, early in development, the deep penetrating arteries that supply the watershed zone of the periventricular white matter lack the vascular anastomoses that help maintain perfusion during periods of hypotension. As the fetus matures, the number of anastomoses between the deep penetrating arteries increases, and the periventricular white matter becomes less susceptible to small decreases in blood pressure. The second vascular developmental factor that plays a role in periventricular leukomalacia is related to cerebral autoregulation. Premature infants have impaired cerebrovascular blood flow autoregulation, increasing their susceptibility to periventricular leukomalacia and intracranial hemorrhage (ICH). Decreased blood flow affects the white matter at the superolateral borders of the lateral ventricles. The site of injury affects the descending corticospinal tracts, visual radiations, and acoustic radiations. The incidence of periventricular leukomalacia ranges from 4-26% in premature infants in neonatal intensive care units (NICUs). The incidence of periventricular leukomalacia is much higher in reports from autopsy studies of premature infants. As many as 75% of premature infants have evidence of periventricular leukomalacia on postmortem examination. Infants with periventricular leukomalacia are at risk for development of neurodevelopmental deficits. Mild periventricular leukomalacia is often associated with spastic diplegia. Severe periventricular leukomalacia is associated with quadriplegia. Severe periventricular leukomalacia is also associated with a higher incidence of intelligence deficiencies and visual disturbances. Periventricular leukomalacia occurs most commonly in premature infants born at less than 32 weeks' gestation. Many infants with periventricular leukomalacia later develop signs of CP. Spastic diplegia is the most common form of CP following mild periventricular leukomalacia. Severe periventricular leukomalacia is frequently associated with quadriplegia. Varying degrees of intellectual impairment, developmental impairment, or both have been reported in association with periventricular leukomalacia. Fixation difficulties, nystagmus, strabismus, and blindness have been associated with periventricular leukomalacia. Some cases of visual dysfunction in association with periventricular leukomalacia occur in the absence of retinopathy of prematurity, suggesting damage to optic radiations as causation. Nelson KB, Ellenberg JH. Predictors of low and very low birth weight and the relation of these to cerebral palsy. JAMA. 1985 Sep 20. 254(11):1473-9. [Medline]. Perlman JM, Risser R, Broyles RS. Bilateral cystic periventricular leukomalacia in the premature infant: associated risk factors. Pediatrics. June 1996. 97:822-7. [Medline]. Kadhim H, Tabarki B, Verellen G, et al. Inflammatory cytokines in the pathogenesis of periventricular leukomalacia. Neurology. 2001 May 22. 56(10):1278-84. [Medline]. Ellison VJ, Mocatta TJ, Winterbourn CC, et al. The relationship of CSF and plasma cytokine levels to cerebral white matter injury in the premature newborn. Pediatr Res. 2005 Feb. 57(2):282-6. [Medline]. Khwaja O, Volpe JJ. Pathogenesis of cerebral white matter injury of prematurity. Arch Dis Child Fetal Neonatal Ed. 2008 Mar. 93(2):F153-61. [Medline]. [Full Text]. Inomata K, Mizobuchi M, Tanaka S, et al. Patterns of increases in interleukin-6 and C-reactive protein as predictors for white matter injury in preterm infants. Pediatr Int. 2014 Dec. 56(6):851-5. [Medline]. Volpe JJ, Kinney HC, Jensen FE, Rosenberg PA. The developing oligodendrocyte: key cellular target in brain injury in the premature infant. Int J Dev Neurosci. 2011 Jun. 29(4):423-40. [Medline]. [Full Text]. Okumura A, Hayakawa F, Kato T, et al. Hypocarbia in preterm infants with periventricular leukomalacia: the relation between hypocarbia and mechanical ventilation. Pediatrics. 2001 Mar. 107(3):469-75. [Medline]. [Full Text]. Wiswell TE, Graziani LJ, Kornhauser MS, et al. Effects of hypocarbia on the development of cystic periventricular leukomalacia in premature infants treated with high-frequency jet ventilation. Pediatrics. 1996 Nov. 98(5):918-24. [Medline]. Shankaran S, Langer JC, Kazzi SN, Laptook AR, Walsh M. Cumulative index of exposure to hypocarbia and hyperoxia as risk factors for periventricular leukomalacia in low birth weight infants. Pediatrics. 2006 Oct. 118(4):1654-9. [Medline]. Resch B, Neubauer K, Hofer N, Resch E, Maurer U, Haas J, et al. Episodes of hypocarbia and early-onset sepsis are risk factors for cystic periventricular leukomalacia in the preterm infant. Early Hum Dev. 2012 Jan. 88(1):27-31. [Medline]. Tzarouchi LC, Astrakas LG, Zikou A, et al. Periventricular leukomalacia in preterm children: assessment of grey and white matter and cerebrospinal fluid changes by MRI. Pediatr Radiol. 2009 Dec. 39(12):1327-32. [Medline]. Kidokoro H, Anderson PJ, Doyle LW, Woodward LJ, Neil JJ, Inder TE. Brain injury and altered brain growth in preterm infants: predictors and prognosis. Pediatrics. 2014 Aug. 134(2):e444-53. [Medline]. Volpe JJ. Hypoxic-ischemic encephalopathy. Neurology of the Newborn. 5th ed. Philadelphia, PA: Saunders-Elsevier; 2008. Volume 899: chapter 9. Tong AY, El-Dairi M, Maldonado RS, et al. Evaluation of optic nerve development in preterm and term infants using handheld spectral-domain optical coherence tomography. Ophthalmology. 2014 Sep. 121(9):1818-26. [Medline]. [Full Text]. Baud O, Foix-L'Helias L, Kaminski M, et al. Antenatal glucocorticoid treatment and cystic periventricular leukomalacia in very premature infants. N Engl J Med. 1999 Oct 14. 341(16):1190-6. [Medline]. Canterino JC, Verma U, Visintainer PF, et al. Antenatal steroids and neonatal periventricular leukomalacia. Obstet Gynecol. 2001 Jan. 97(1):135-9. [Medline]. Bass WT, Jones MA, White LE, et al. Ultrasonographic differential diagnosis and neurodevelopmental outcome of cerebral white matter lesions in premature infants. J Perinatol. 1999 Jul-Aug. 19(5):330-6. [Medline]. Baud O, d'Allest AM, Lacaze-Masmonteil T, et al. The early diagnosis of periventricular leukomalacia in premature infants with positive rolandic sharp waves on serial electroencephalography. J Pediatr. 1998 May. 132(5):813-7. [Medline]. Dammann O, Hagberg H, Leviton A. Is periventricular leukomalacia an axonopathy as well as an oligopathy?. Pediatr Res. 2001 Apr. 49(4):453-7. [Medline]. [Full Text]. Dammann O, Leviton A. Brain damage in preterm newborns: might enhancement of developmentally regulated endogenous protection open a door for prevention?. Pediatrics. 1999 Sep. 104(3 Pt 1):541-50. [Medline]. [Full Text]. de Vries LS, Regev R, Dubowitz LM, et al. Perinatal risk factors for the development of extensive cystic leukomalacia. Am J Dis Child. 1988 Jul. 142(7):732-5. [Medline]. De Vries LS, Van Haastert IL, Rademaker KJ, et al. Ultrasound abnormalities preceding cerebral palsy in high-risk preterm infants. J Pediatr. 2004 Jun. 144(6):815-20. [Medline]. Dyet LE, Kennea N, Counsell SJ, et al. Natural history of brain lesions in extremely preterm infants studied with serial magnetic resonance imaging from birth and neurodevelopmental assessment. Pediatrics. 2006 Aug. 118(2):536-48. [Medline]. Enzmann DR. Imaging of neonatal hypoxic-ischemic cerebral damage. Stevenson DK, Sunshine P, eds. Fetal and Neonatal Brain Injury: Mechanisms, Management, and the Risk of Practice. 2nd ed. Oxford, England: Oxford University Press; 1997. 302-55. Hahn JS, Novotony EJ Jr. Hypoxic-ischemic encephalopathy. In: Stevenson DK, Sunshine P, eds. Fetal and Neonatal Brain Injury: Mechanisms, Management, and the Risk of Practice. 2nd ed. Oxford, England:. Oxford University Press. 1997:277-286. Hayakawa F, Okumura A, Kato T, et al. Determination of timing of brain injury in preterm infants with periventricular leukomalacia with serial neonatal electroencephalography. Pediatrics. 1999 Nov. 104(5 Pt 1):1077-81. [Medline]. [Full Text]. Haynes RL, Baud O, Li J, et al. Oxidative and nitrative injury in periventricular leukomalacia: a review. Brain Pathol. 2005. 15:225-233. [Medline]. Kuban K, Sanocka U, Leviton A, et al. White matter disorders of prematurity: association with intraventricular hemorrhage and ventriculomegaly. The Developmental Epidemiology Network. J Pediatr. 1999 May. 134(5):539-46. [Medline]. Leviton A, Paneth N, Reuss ML, et al. Maternal infection, fetal inflammatory response, and brain damage in very low birth weight infants. Developmental Epidemiology Network Investigators. Pediatr Res. 1999 Nov. 46(5):566-75. [Medline]. Liao SL, Lai SH, Chou YH, Kuo CY. Effect of hypocapnia in the first three days of life on the subsequent development of periventricular leukomalacia in premature infants. Acta Paediatr Taiwan. 2001 Mar-Apr. 42(2):90-3. [Medline]. [Guideline] Ment LR, Bada HS, Barnes P, et al. Practice parameter: neuroimaging of the neonate: report of the Quality Standards Subcommittee of the American Academy of Neurology and the Practice Committee of the Child Neurology Society. Neurology. 2002 Jun 25. 58(12):1726-38. [Medline]. Murata Y, Itakura A, Matsuzawa K, et al. Possible antenatal and perinatal related factors in development of cystic periventricular leukomalacia. Brain Dev. 2005. 27:17-21. [Medline]. Paul DA, Pearlman SA, Finkelstein MS, Stefano JL. Cranial sonography in very-low-birth-weight infants: do all infants need to be screened?. Clin Pediatr (Phila). 1999 Sep. 38(9):503-9. [Medline]. Shankaran S. Hemorrhagic lesions of the central nervous system. Stevenson DK, Sunshine P, eds. Fetal and Neonatal Brain Injury: Mechanisms, Management, and the Risk of Practice. 2nd ed. Oxford, England: Oxford University Press; 1997. 151-64. Volpe JJ. Brain injury in the premature infant: overview of clinical aspects, neuropathology, and pathogenesis. Semin Pediatr Neurol. 1998 Sep. 5(3):135-51. [Medline]. Cranial ultrasound, coronal view, in 1-week-old premature infant. The periventricular echotexture is abnormally increased (greater than or equal to that of the choroid plexus), which is consistent with the early changes of periventricular leukomalacia (PVL). Courtesy of Matthew Omojola, MD. Cranial ultrasound, coronal view, in 1-week-old premature infant without periventricular leukomalacia (PVL). The periventricular echotexture is normal. Compare with the previous image. Courtesy of Matthew Omojola, MD. Cranial ultrasound, sagittal view, in 3-week-old premature infant. Multiple periventricular cysts are typical of this stage of periventricular leukomalacia (PVL). Courtesy of Matthew Omojola, MD. Cranial CT scan, axial image, in a 5-week-old premature infant with periventricular leukomalacia (PVL). The ventricular margins are irregular, which is consistent with incorporation of the periventricular cysts of PVL. Mild ventriculomegaly and loss of the periventricular white matter is observed. Courtesy of Matthew Omojola, MD. Cranial CT scan, axial image, in 14-month-old with periventricular leukomalacia (PVL). Ventriculomegaly is limited to the lateral ventricles secondary to diffuse loss of periventricular white matter. Courtesy of Matthew Omojola, MD. Cranial MRI, T1-weighted axial image, in an 18-month-old with periventricular leukomalacia (PVL). The lateral ventricles are enlarged without hydrocephalus. The periventricular white matter is diminished. Courtesy of Matthew Omojola, MD. Cranial MRI, T2-weighted axial image, in an 18-month-old with periventricular leukomalacia (PVL). Again, enlarged ventricles and loss of white matter are demonstrated. Also noted is the abnormal increased signal in the periventricular regions on this T2-weighted image. Courtesy of Matthew Omojola, MD. Cranial MRI, sagittal T1-weighted image in the midline, in an 18-month-old with periventricular leukomalacia (PVL). Hypoplasia of the corpus callosum is present and is most evident, involving the body. Courtesy of Matthew Omojola, MD.